The Spanish energy engineering company E & M Combustion, specialized in the development of Combustion Technologies, has set the objective of continuing the expansion and diversification of markets, focusing on the emerging countries of Southeast Asia, where a great potential has been detected, as the zone develops a process of industrialization, as well as the improvement of energy infrastructure and energy efficiency of its facilities. The Spanish company is also enhancing its commercial implementation in India, where it has signed its first contracts to modernize several refineries, whose burners are been finished in the Artea facilities (close to Bilbao), to be delivered throughout this year. E & M Combustion attributes to India a great potential for its combustion equipment, since the country is hardening the environmental requirement to reduce pollution. E & M’s foreign operation expands to Kuwait, where it recently entered with the delivery of a burner for one of its refineries, and to China. In this country, according to company officials, the difference in the emissions of their equipment, less than 30 mg of NOx, has made it possible to provide equipment to District Heating units, with four burners for one local municipality. 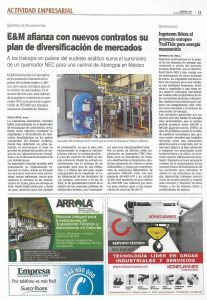 For its part, in Mexico, it is implementing an NEC burner of class I and division 2, designed to install in areas with anti explosive classification, to adapt to the American guidelines that regulate the potentially explosive atmospheres, which allows to guarantee safety. 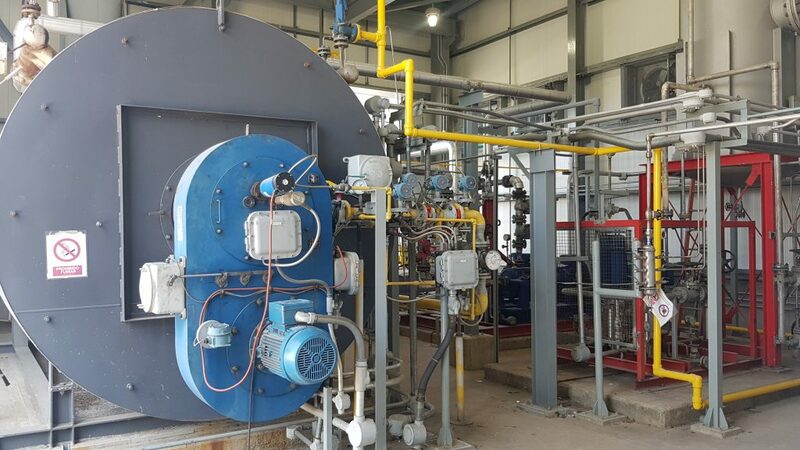 Thus, the burner JBM-HP 4,500-G, with a power 450-4500 kW and a flow 43-425, is mounted in a boiler of the company Heat 11 of 3.750 KW that will use natural gas to obtain water at a service temperature 160ºC, and with an operating pressure of 40 bars. The 3.730 KW boiler is designed to heat the gas when the turbine operates above 75 MW and up to 250 MW of its maximum range. The ignition of the NEC burners is another aspect to consider. It is produced throw pilot burners, in which the spark that produces the ignition is located in the internal part of the equipment, practically in the end of the flame tube. In addition, the ignitor is protected by a metal tube and the ignition transformer is installed in a certified box according to the characteristics of the area in question. It should be noted that although the manufacture of NEC and ATEX burners is increasingly widespread, few companies are able to manufacture equipment tailored to the specific requirements of the customer with respect to the definition of areas at risk of explosion.